I’m always fascinated by the artistic process. The idea of letting a piece of art evolve and become what it wants to be is one aspect of art that keeps me coming back to the worktable. This is one piece where I didn’t have a specific goal in mind when starting out. The process of choosing collage papers and adding paint is always wonderful medicine and a great escape from the cares of daily life. As mentioned in a previous post, I played with the lettering a bit, but decided I liked the stamped letters on book paper. The placement needed to be refined as well, so I added the collage flower. Upon further evaluation, it seemed the piece needed more pattern to break up some of the solid areas of color. 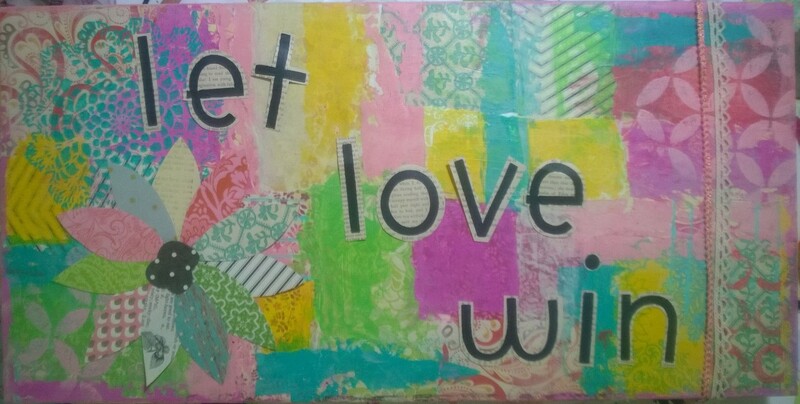 This was done with stencils from my collection. I then used ink to define the flower. The piece was sealed with UV satin varnish, and then sprayed with a matte sealer to knock down the shine a bit. 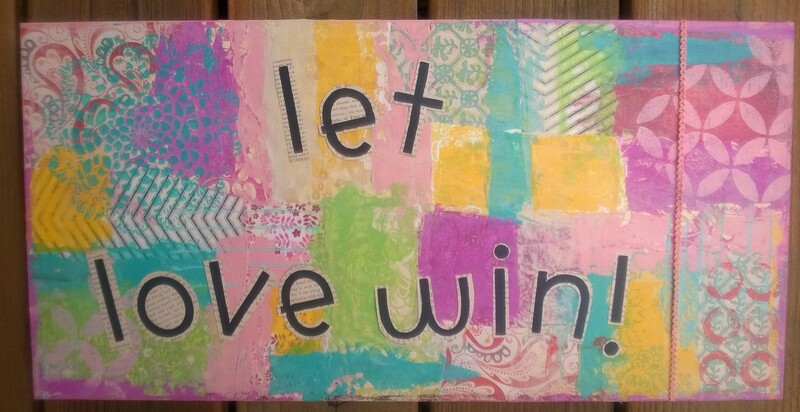 What does it mean to “let love win”? To me it means choosing to be patient and kind when I’m tempted to be otherwise. It means believing the best about people and situations when there’s room for doubt. This is the phrase I say in my head when those moments arise. Perhaps it’s not surprising that it found its way into my art! Do you have a phrase that helps you stay calm in stressful situations? I’d love to hear it. I say, HALT – am I hungry, angry, lonely, tired? It doesn’t remove the stressor but it helps me figure out why I might be reacting as I am and to do something to help me feel calmer and deal with things. I liked seeing the evolution of your work on this piece. Thanks for showing it. I agree, Claudia. HALT is a great way to manage stressful situations, too. then I paused and thought about what phrase pops in my head, to help me…..
“Don’t panic TOO soon!” is one that often plays a refrain when I’m trying to finish an artwork and have gotten a bit miffed when its not quite working as planned. I well and truly know dozens ….of ways to fix and resolve the problems. Hence, the don’t panic too soon phrase. Thank you Debi. I like your phrase, too. It can definitely be used in parenting as well as art! I agree, Carrie! Emotions are not always to be trusted. Have a great week.